Let’s start with an obvious statement. Getting your target salary right for any vacancy plays an important role in ensuring that the search and selection process is smooth and timely. 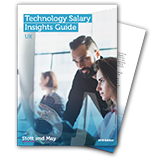 This salary insights guide covers the key roles in our technology market focus areas including: Software Development & Architecture, IT Infrastructure, Cyber Security, Data & Analytics and Business Change & Transformation. The data is a compilation of salary information provided by over 190,000 candidate interactions with the support of insight provided by Stott and May consultants and clients.